When you do something that you have always wanted to do, like you know, always always wanted to do with all your heart, doing it finally gives you a sense of fulfilment, even if that thing you wanted was very trivial. I knew this was one of those content moments when I lay face up, looking at the blue skies above me. My head rested on her head, my legs on the base of her tail. The five and a half foot creature below me was a mare named Megha. Even as a kid, I had always been fascinated by the world of the ancient kings and queens and princesses. Above all, I had been crazy about battles and wars, and ancient warriors with their horses and swords and spears. And it has been one of my dearest dreams to learn all the skills of a warrior – sword fighting, archery, spear throwing, and of course, riding a horse. And as my luck would have it, there was a Riders Club at the Essar Township in Hazira, where i was doing my PS1 in the summer of 2008. Riders Club had a vast lush green ground, and in the centre of these lawns was a circular, sandy patch of land, meant for the learners. They had eight mares, one horse and a few foals maintained in excellent shape. There were Chandni and Bijli, Noor Jahan and Roshni, Suraj and Pawan, and the most beautiful of all, Megha – a sheer black-skinned mare, with a single white spot on her forehead. I wanted to ride her the moment I saw her, tall and gleaming in the sun, strutting around proudly. But the coach would have none of it. He said that Megha was the most violent of all the beats, and I couldn’t ride her for two months at the least. Instead, I was to mount Noor Jahan, a chestnut coloured mare with a calm air around her. The coach told me that she was the most good natured of all of them, and so beginners always rode her for a month or so. It was a good thing she was so calm, because riding wasn’t as easy as it looked. The first speed, walking as they called it, was easy enough (as long as the horse didn’t jerk a leg or sway its head without any warning). But the tough part came at the end of the lesson, when the coach announced that we were to perform some exercises to remove the fear of riding a horse. Honestly speaking, the exercises were much more fearsome than the riding itself. They made us support our weight on our hands rested on the mare’s mane, n then lift the whole body from the saddle, legs dangling in the air (Luckily, the horse was supposed to be stationary during all this). I wondered what would happen if Noor Jahan chose the time to suddenly give herself a jerk and start trotting. The coach even made us lie down on the beast completely, face up, with just our arms to hold the saddle. It was supposed to remove all fear, you see. The next speed was trotting, which is faster than walking but slower than galloping. It seemed fairly simple to look at, but I realised it was a back break when I sat on the horse, and it started tossing me up in the air every time it rose while trotting. Three rounds in the arena, and my back hurt because of all the ups and downs. The trick was, the coach said, to move up and down in the saddle with the rhythm of the horse, which I admit wasn’t that easy. The fact that I was just five-feet-two made it even more difficult. But very soon, those 15-20 minutes spent riding became the most eventful minutes of my day. 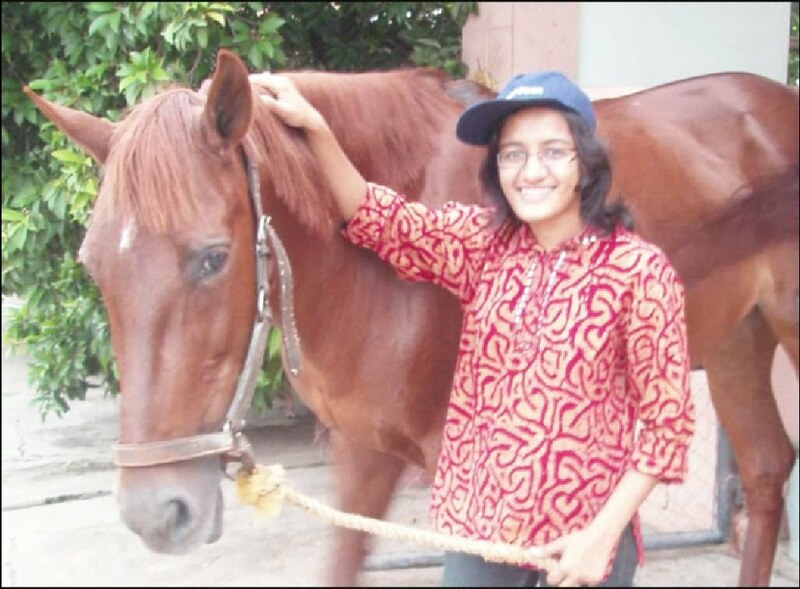 As more people joined, Noor was employed for the newcomers, and I got to ride different horses. I rode Pawan a few times, a snowy white Indian horse, shorter and stockier than the rest of his mates. And then one day, Pawan was ill, Noor was busy and so were the other mares. The only one left for me was, yes, Megha! I was overjoyed! Mounting her – it felt like heaven, but riding her felt like, well, being really close to heaven. She trotted like there was no one astride her; I had one hell of a time telling myself that she isn’t trying to throw me off herself. I pictured Aragorn in my head, and told myself that I had to brave this if I’m to become a rider like him. (Yes, I’m that weird. And if you don’t know Aragorn, you are so.) An interesting moment came when we were doing the exercises and I was lying on her back, when suddenly she jerked one head and started walking briskly. Luckily the coach had anticipated this, so he had been standing nearby to control her if need be. But well, all good things end too soon. Within 3 weeks of my training, it started raining in Hazira. And when it rains at the Coast, it rains for days at a stretch. After a three day spat of rain, I visited the Club, only to see our arena all muddy and the lawns submerged in water. One thing was certain, it would take days to dry up completely and be suitable for the hooves of a horse, and by that time, it would start raining again. So thus my training was cut short. But nevertheless, I was happy to have lived my dream, though for a short time. I know I’m going to become a fairly good rider one day, but till then, these small memories will remain to be one of the most beautiful ones I have had. 10 Responses to "A Gallop"
gud gud! tera likhne ka style to achcha hai hi! haan i know.. you read it just now!! Nice that you started your own blog. Its a good way of articulating your thoughts. Try to make it abit short next time. @ Janhavi: thanks! will remember to make it short next time! Liked the narration style..Keep writing. @ wolverine: I'm glad this post inspired someone! @ K.G. yeah it was one hell of an experience! i like your style of writing this one sounds like a great experience!